The aviation and airline industry as a whole has been talking about a significant shortfall globally in pilots over the next two decades, and that murmur has recently been rising closer to a shriek. The problem is that aviation maintenance technicians and mechanics are facing perhaps an even bleaker outlook of their own. Unlike other types of industrial maintenance and vehicle maintenance in which trade schools can produce skilled technicians in 18 months or so, aircraft mechanics take much longer to create, and there is a much more rigorous regulatory barrier to entry. But all is not lost yet, so let’s take a look at this situation and where it is headed. How big is the actual demand for aviation maintenance technicians? This shortage really should not be looked at as a precipice, because that is not an accurate portrayal of the shortage. A precipice implies that you have been traveling on level ground and suddenly come upon an impasse; the technician shortage is not that. It has been mounting for a while, with airlines and MROs sliding downhill toward the abyss for many years, and it has been getting steeper to near-vertical. Boeing’s technician forecast, which is taken as the gospel truth in the industry, predicts a world demand of 754,000 new technicians by 2037. The Asia-Pacific region represents the largest need at 257,000, with North America at 189,000, and Europe needing 132,000. The global aviation maintenance technician workforce will need to add almost 38,000 new technicians annually in order to meet the projected demand. This is only part the story. The demand for air travel and jet aircraft continue to rise globally, spurred on by lower oil prices, increases in GDP and the corollary disposable income, and expanding middle classes. The emergence of numerous low-cost and ultralow-cost air carriers have placed considerable pressure on major legacy airlines to drop fares, particularly on domestic routes which form the backbone of all airlines. Without any question, the global demand for air travel is increasing dramatically with projected demand in 2037 being 2.5 times the current demand. To accommodate this demand the global fleet is going to double, with 56% of new deliveries being to accommodate growth rather than just standard fleet upgrade and replacement. Of the remaining 44% of new deliveries, those will serve to replace approximately three-quarters of the existing fleet, which tells that 25% of 2037 fleet are still going to be made up of legacy aircraft. All of these factors dictate that the technician workforce must not only grow in raw numbers, but in technological methods. Future aircraft are going to be considerably different than legacy aircraft in construction methods and materials, technological connectivity, and additive manufacturing (3D printing of components) to name a few disciplines. At the same time, technicians must be adept at working on legacy aircraft and their technologies which will remain in circulation for many years past 2037, albeit in diminishing numbers. According to a report prepared by the Oliver Wyman Management Consulting company for the Aeronautical Repair Station Association (ARSA), 80.7% of the global MRO market are small or medium enterprises, and U.S. MROs are higher at 84.7%. This is in direct contrast to the idea that commercial aircraft maintenance only occurs in mega-organizations and locations like American Airline’s enormous facility in Tulsa, Oklahoma. The opposite it true; most MROs are small businesses that face veritable mountains of regulation in everyday operation. Also, they often cannot keep up with the salaries available in other industries with similar skill set requirements, namely railroads and the energy industry. Add into this equation how insanely difficult it is to be fully certified to work in the field and it is no surprise that interest in the field is waning, which is directly impacting MROs. ARSA ran a survey in 2017 of their members which revealed an alarming estimate of nearly $2 billion in lost revenue due to the widening skills gap left by vacant mechanic positions. You want to state updated on the latest news in the ground handling industry? Subscribe to our blog and don’t miss out on new posts! Why is recruitment of aviation maintenance technicians such a hurdle? According to the MROs surveyed by ARSA, the most common factors in staffing were “difficulty finding and retaining technical talent” tied with “regulatory costs/burdens”. Let’s break down the first response into two separate components. The first component is finding technical talent. This should not be as difficult as it is, but it ties into the second factor, “regulatory costs/burdens”. The militaries of the world, namely the U.S. military, operate enormous fleets of aircraft which are unanimously powered by turbine engines. At any given time, there are several hundred thousand aviation maintenance technicians in the combined ranks of the armed forces, all of whom have usually a minimum of four years practical, hands-on experience. Common sense dictates that the transition from military aircraft to commercial should be easy and almost seamless, and the amount of available talent (not taking into consideration the thousands of veterans who formerly worked on military aircraft) in the U.S. military alone would single-handedly erase the shortage of technicians in North America. Yet previous military experience actually helps very little in attaining the licensure necessary to work as an aviation maintenance technician. If every single certified maintenance school in the U.S. closed their doors tomorrow, the surplus of military-trained talent would create a surplus of technicians in North America were it not for regulatory issues. Retaining talent is every bit as significant, and also ties into the first component. Retention of skilled workers will continue to be a serious problem as long as the contributing factors remain in place. Pay is under that of industries with competing skill sets. In 2017, median pay for aircraft mechanics was a respectable $29.34 per hour. That being said, the time and effort to get to the median wage is considerably more difficult than other industries. Regulatory threshold of entry continues to be substantially higher than competing industries. Industry growth is outpaced by competing markets. Oil and gas workers are seeing growth around 25% over the next decade, as opposed to 5% in aircraft maintenance. The median pay may be slightly lower depending on different disciplines, but the opportunity for growth vastly outweighs marginal pay differences. The regulatory aspect is the most difficult hurdle to clear because it will always be the slowest to change. However, if the industry lobby pushes hard enough the right way it is not impossible to see a reduction in senseless red tape. For example, look at the curriculum of the aviation maintenance schools, which are built around the regulatory criteria. In the U.S., a prime example considering their role as #2 global demand, aspiring A&P mechanic candidates must be taught such archaic skills like timing a magneto, adjusting a carburetor, splicing wood on a wooden-framed airplane, and fabric covering techniques. Not one of these skills has anything even remotely close to doing with modern airliners, or particularly the airliners which will roll out of production over the next two decades. Young technicians need to be given latitude into which area of aircraft maintenance they plan to pursue; if they wish to work at a line MRO or a repair shop specializing in light general aviation, then learning to adjust a carburetor and time a magneto is important, and even splicing wood and patching fabric to a certain degree. But to the young person choosing a direction at a trade school for the strict purpose of securing good employment upon graduation, such extraneous and senseless training may mark the turning point for that individual. Young adults seeking tradecraft training are largely looking at the future of technical work which is robotics, AI, composite design, the internet of things, and advanced propulsion. Technicians do not generally want to learn a trade which takes them to bygone technology many decades in the past; that technology isn’t transferable to anything except antique tractors and vintage automobiles which are not markets that are burning up the industry. The workforce has changed. No longer does anybody join a company and expect to remain there until retirement age. That is a bygone era, but seems to be one which aviation is remiss to comprehend. Aviation as a whole is a dichotomy: on one hand, emerging technology (IoT, AI, machine learning, 3D printing) shows great promise and is largely being eagerly accepted. Yet, on the other hand there are terrible barriers of entry for both pilot and maintenance technician, and an overall sense of being left behind. The major manufacturers (Boeing, Airbus, Bombardier, etc.) embrace future tech and see it for the value it presents, but an enormous bottleneck is looming as long as the technical workforce continues to shrink and deteriorate. It is shrinking because of more than one reason: right now, the lack of technically skilled craftsman is diminishing in all trade skills because less young people are opting to learn a skill. 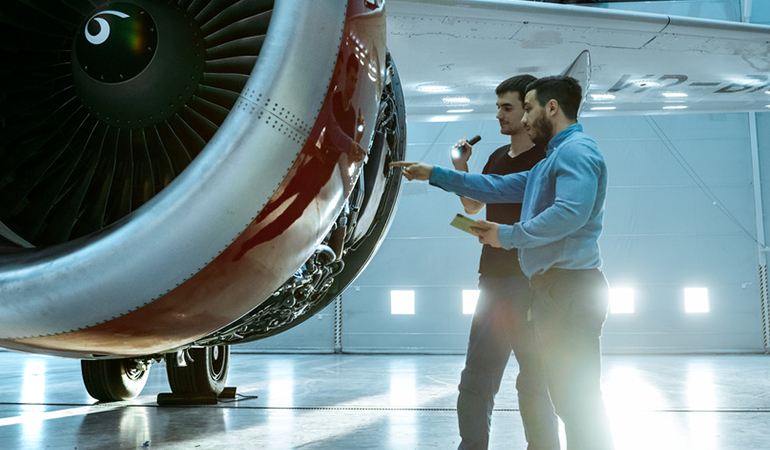 The technical workforce at large is working through a crisis of far too few skilled workers, and aviation draws the short straw when it takes so much longer to be work-ready than comparably paying career paths. Standard attrition from retirement is another problem, although not a very alarming one. Truthfully, technology is changing so rapidly that a fresh set of eyes in the new generation of workers is necessary for the future of aviation maintenance work. Their predecessors cut their teeth on highly mechanical aircraft; the next generation of aircraft are technologically driven and the aging workforce may not be inclined to relearn what they have known for so long. The attrition which the industry really cannot afford is losing young and mid-career talent to competing industries. But who can blame them? If they choose aviation, work through the long and arduous process of certification only to be stuck at the low end of the pay scale, you have to anticipate that they will be poached for their coveted skills by industries with very deep pockets (railroads and gas companies, namely). You cannot replace a 10-year veteran of aircraft maintenance with an apprentice out of a trade school; it takes another decade to do that. This is the most immediate way that the industry can effect change on the shrinking workforce: keep the talent you have in place. There are no quick fixes to the manpower shortages facing aviation, and you must first accept that it did not happen overnight. This problem has been years in the making but it is going to have serious consequences for life in general if it is not fixed. Boeing and Airbus can make as many jets as they want but it will all be for nothing if they do not have the bodies to fly them and fix them. Streamline entry for those with prior, directly-relatable skills, i.e., the surplus of military aircraft technicians. Strip away the extraneous tasks which jet and turbine technicians will never, ever do and allow experienced military technicians to cross directly into the work which they have already proven able to do and have a long line of verifiable training to back it up. Streamline the training process for apprentice students and workers to entice them into the industry. Allow MROs and airlines to take them on as an unlicensed apprentice technician and conduct their own curriculum in-house. This is a topic which could go on for pages, but you won’t be subjected to that. Flatly, the industry will stall if regulations aren’t gutted and either left alone or restructured in a sensible manner. MROs cannot afford to pay their technicians more because of the regulatory burden, and technicians are going elsewhere because of the same regulatory burdens. No matter which way you cut it, the bureaucracy is eating aviation alive. Experienced workers (military aircraft techs) directly relatable to the industry have to start at the beginning like an apprentice, and true apprentices are lacking altogether because they either fail the extremely difficult certification battery or drop out due to lost interest. The manufacturers will only see that their finished products are parked on the ramps at so many airports if regulations aren’t eased way back to allow people in and actually learn and work in the jobs of pilots and aircraft maintenance technicians. What’s your experience on that matter? How do you overcome technician shortage and where do you see the industry heading in the future? Leave a comment below! Sign up for our blog and always stay up-to-date! 100% free and no spam.